Recently I read an interesting paper in science magazine titled Anthropegenic and Natural Influences in the Evolution of Lower Stratospheric Cooling by V. Ramaswamy et al. Different atmospheric forcings (natural and anthropogenic) and their degree of influence are analyzed using data and models. NOAA satellites, specifically channel 4 of the microwave sounding unit (MSU), provide the observational data. Analysis of the data is performed using a coupled atmospheric-ocean model (CM2.1) from the Geophysical Fluid Dynamic Laboratory. Simulations are run under different conditions and compared to the data, which highlights the primary processes causing the cooling in the stratosphere. Five different experiments were run: (i) natural + anthropogenic (AllForc), (ii) natural (Nat), (iii) well-mixed greenhouse gases (Wmgg), (iv) well-mixed greenhouse gases + stratospheric and tropospheric ozone (WmggO3), (v) anthropogenic (Anth = WmggO3 + tropospheric aerosols + land-use change). Each run had a fixed pre-industrial (1860) atmospheric composition and was integrated from 1861 to 2003. Plotted temperatures are annual mean anomalies relative to 1979-1981 averages. This article has seven graphs in total, but I am skipping the first five because I feel the last two highlight the main point of the author’s research. The first five contour plots show two features, the QBO at the equator and high latitude dynamical variability in the Northern Hemisphere. Other aspects of the plots are practically repeated in the last two graphs of globally averaged simulations and data shown below. There are a few major features to notice in these two graphs. First, the top graph, Figure 3A, is used to justify the model used in their research. It shows how the AllForc simulation from the coupled model captures trends in the MSU data, thus model reliability. The second graph is used to analyze different forcess in the stratosphere and their relative importance. The first thing to notice is that temperature decline is primarily driven by ozone depletion, then well-mixed greenhouse gases. Secondly, there is a gradual increase of cooling until the mid to late 1990′s. After which the cooling levels off and actual starts to decrease after the year 2000. Finally, natural forcing (Nat) lacks the overall global mean cooling shown by other processes but it still contributes to the cooling in the AllForc plot. Another, more detailed feature to notice is the step like cooling highlighted in 1985 and 1994. Cooling during and after those two years is due to two volcanic eruptions: El Chichon around 1983 and Pinatubo in 1992. The effects from the eruptions are shown through the Natural forcing (Nat) plot on Figure 3B and are about the same during both time frames. Slight cooling in the Nat plot is contributed to a decrease in solar irradiance (solar minimum) and tropospheric cooling as a result of volcanic aerosols. This tropospheric cooling at the surface causes less upwelling of long wave radiation flux into the stratosphere, thus cooling. In addition Figure 3B shows ozone as the primary contributor to cooling after both eruptions. This is immediately apparent when comparing the plots of Wmgg and WmggO3. Eventually the troposphere temperatures recover after the volcanic aerosols decay, this process is slow due to the thermal inertia of the oceans. One major difference between the two cooling periods is the slope of the AllForc plot. The first cooling phase is steady while the second cooling phase levels off in the mid 1990′s, and then starts to decrease after approximately 1998. This can be attributed to a decrease in ozone depletion. There are uncertainties in this study that could be improved upon for future research projects. First, knowledge of ozone profiles after a volcanic eruption is incomplete and addition of more information could add to simulated cooling. Insight to the evolution of cooling could be improved upon by adding explicit stratospheric chemistry to the atmosphere-ocean model. Also, the extent that upper troposphere species affect temperature and how much water vapor is in the stratosphere is not well known. Lastly, dynamical influences on stratospheric ozone could affect global temperatures but anthropogenic influences on ozone are larger. 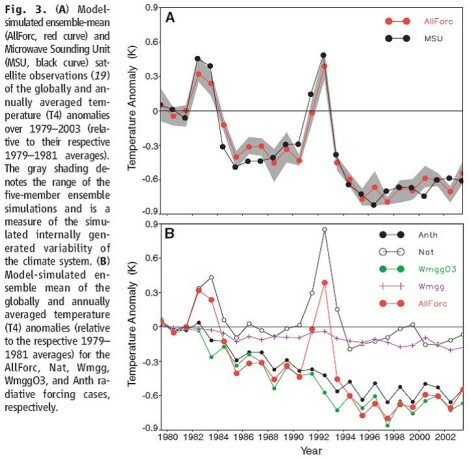 The final conclusion of the paper is that the observed temperature anomalies in the lower stratosphere are due to both anthropogenic and natural forcing. AllForc simulation from the model duplicates both the step like transitions and the steady periods. Natural forcing tends to modulate the global cooling. Without natural forcing the temperature would show a steady decrease due to anthropogenic forcing. Currently ozone depletion dominates the temperature decrease in the stratosphere, so anthropogenic outweighs natural forcing. However, if ozone levels recover as anticipated, due to reductions in halogen loadings, natural forcing will become relatively more important than period considered here.